We specialize in the production of extruded rubber products that can meet the variegated requirements of our clients. We have developed our expertise in the manufacture of products as per the specific requirements of our clients, which they can avail at industry leading prices. 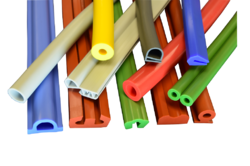 We are supplier of extruded rubber profiles and tubing, with standard styles encompassing 11 basic configurations, including the most popular ones; P strips, U Channels, and D strips. Many of these styles are available from our inventory for immediate shipment, and in many instances in more than one material. Find that none of our standard profiles meet your needs? Not a problem, with our in-house tooling capabilities we can produce an extrusion die, tailored to your specific application. Our company is well known in the market for manufacture and supply of Platinum cured Silicone Braided Hose which are available in range of sizes. These Hoses are manufactured from high quality raw material which are in compliance with the norms of industrial standards. They are unaffected by most water soluble materials. It has excellent flexibility (can be stretched as well as compressed). It is non reactive to body tissue and fluid. Due to optimum strength, compact design, perfect finish and durability, this Silicone Braided Hose is highly demanded in various industrial units. These braided hoses are manufactured by us using superior grade materials along with updated techniques. Our patrons can easily avail these hoses from us at pocket friendly rates. These are quality checked on various levels before being launched. We are already supplying our Silicone hose to various Dairy/Pharma/Chemical industries.